independently (if you adopted an online sales register from other sources). To transmit fiscal information using our help, adopt an online sales register of one of our partners: Orange Data, ATOL Online, ModulKassa, or Business.Ru. Navigate to the Working with online sales register section of Settings, and select Using Yandex.Checkout. You will be able to set up the interaction with you online sales register. They can be different depending on which of our partners' online sales register you have adopted. Register the Online sales register group code and your taxation system. Online sales register group code is the Group parameter in the My online sales registers section in your personal dasboard at Orange Data. You need to register three parameters: login for token, password for token and the Online sales register group code. a. Navigate to My companies section in your personal dashboard at ATOL. b. Click the Settings for CMS file button. c. You will download the .XML file with the settings. Find the access element: it contains all three parameters. 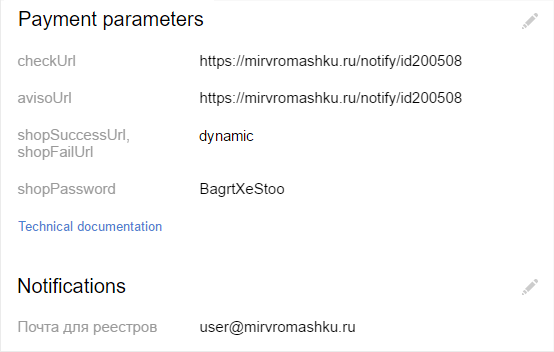 d. Copy these parameters to your Merchant Profile at Yandex.Checkout. Login for token is the login of your personal dashboard at ModulKassa. Password for token is the password of your personal dashboard at ModulKassa. Online sales register group code is the identifier if the retail outlet in your personal dashboard at ModulKassa. a. View the Integration section of your personal account in the "Business.ru Online Receipts" service. b. Select the Yandex.Checkout sign and click Implement integration or Edit. c. Copy the parameters to your Yandex.Checkout Merchant Profile. Login for token — Login. Password for token — Password. Online sales register group code — Group_code. Specify which address will be shown in the receipt. It can be either the actual address of your store (city, street, house) or the website address (URL). Provide the address for error messages: an email address we will send the error messages to. If your online sales register stops responding, we will immediately send a letter to that email address. In 3 days (recommended): first the payment is processed, then the receipt formation data is sent to the online sales register. If the online sales register doesn't respond, the payment will be processed but the receipt might not be sent (in this case, you will receive an email notification to the Address for errors). The receipt can be sent again from the Payment history section of your Merchant Profile. For 5 minutes: first, we send the details for the receipt to the online sales register. When it responds with the positive assessment of the receipt, we will start the payment process. If your online sales register does not respond within 5 minutes (for instance, something is wrong on the provider's side), the payment will be aborted: the money will be returned to the buyer. This option can be used only if your communication channel with the online sales register works flawlessly (otherwise, there will be problems with payments). If you operate a self-built website, add the following new parameters to the payment request: product names, their prices, VAT rates, as well as buyers' details. If you're connected to Yandex.Checkout via a payment module, update it and enable it to transmit receipt data. Contact your platform's support service in case it doesn't have that option. That's it: now we will transmit the receipt data to your online sales register and inform you of any receipt errors (if they ever occur). This option is for the merchants who have adopted an online sales register provided by someone other than one of our partners (Orange Data, ATOL, ModulKassa). Navigate to the Working with online sales register section of Settings, and select Independently. That's it: the payments will be processed by Yandex.Checkout regardless of whether or not your online sales register is operating. Name to be viewed to buyers—the name showed in the course of a payment and in emails with invoices and electronic payment receipts. It is saved to Yandex.Money Wallet users' History of payments. Store's site is an address of the site accepting payments via Yandex.Checkout. If the store does not have a site, address is not shown. shopId—store's identifier in our system; it is used in payment forms and requests to Yandex.Checkout. scid is an identifier of the showcase (payment form on our side). It is used in payment forms and requests to Yandex.Checkout. These parameters depend on the implementation method used by the store. First parameters include addresses in your service to which we send requests about payments. checkUrl is an address for requests for checking and canceling orders. avisoUrl is an address for notifying about successful payments. successUrl is an address for redirecting users after successful payments. failUrl is an address for redirecting users after payment returning errors. This implementation method requires only one parameter: an email address for sending messages about successful payments. As soon as the user pays, we send message with details of the payment to this email. This means, editing settings is temporary blocked. To unlock them, find the message asking you to change your chief officers' details at the top of the page. Push Add to open the form and fill it out. You will again be able to adjust settings via your Merchant Profile.